Ok, I guess you’ve all heard about the Australian Federal Police raid on Labor offices and the homes of Labor staffers. And I guess you’ve heard the various accusations and counter-accusations today. Labor calling it politically motivated, while Turnbull is upset that the integrity of the AFP is being questioned. Of course, the AFP is an independent body and it does things independently, and so the decision to do this raid during an election campaign was made in an independent way on the basis of a complaint from another independent body, the NBN company, which is run by a whole new group of independent people appointed by Tony Abbott after the 2013 election because the independent people that Labor had appointed were far too independent and wouldn’t have understood the necessity of rolling it out more quickly and ensuring that everyone had access by 2016. Anyway, it’s just as well that the NBN is an independent body because apparently an NBN staff member accompanied the AFP on their raid. Not just as a member of the public but as a “special officer”. The role of the special officer was apparently to take photos and send them back to the independent NBN before Labor could have the documents sealed under parliamentary privilege. I’m wondering if this will be part of the new standard operating procedure of the AFP. Like in the case of Mal Brough and James Ashby, will they ask Peter Slipper to accompanying them in any raid? Or will Craig Thomson go along if they have necessity to investigate Kathy Jackson and her independent partner, Michael Lawler, who was a member of the independent Fair Work Australia. Or perhaps, a rival bikie will accompany them if they raid a bikie gang at some future point. The only thing that confuses me is that NBNco was saying that the documents were “incorrect” and “just a draft”, so I just can’t understand why it was necessary for a police raid over such unimportant documents. After all, there was no police raid when it appeared that Andrew Bolt may have been shown classified documents. Neither was there a raid over the leak in the Defence White Paper. So why did the AFP think that this was more important than any of the others. It can’t have simply been because these documents were showing how incompetent Turnbull was as Communications Minister, because that wouldn’t be very independent, would it? Unless there’s a leak from the NBNco “special” officer or one of the people he sent the photos of the sealed evidence… Actually, wouldn’t the passing on of sealed evidence be a leak? I guess when they investigated that one, they’d need a “special officer” from the Labor Party. Turnull is losing credibilty and grey matter. This is nothing more than trying to silence journalists from printing the truth , what country are we living in? Hilariously explaining the absurdities of this fiasco. I hope who ever did whatever leaking, leaked to the right places as well, like say WikiLeaks or somewhere. Otherwise we might not know till after the election or the court case, if there ever is a court case, what we should know well before the election, if it is at all relevant, which I suspect it might be. It always surprises me that the media are there when these raids are on. Somebody must tell them in advance and the pictures and video must be important for some reason beyond selling newspapers. I have heard examples of trial verdicts being deliberately delayed until the media arrive but the workings of the AFP should not be a source of public entertainment. It sort of reminds me of the contrived arrest of Craig Thomson that mysteriously coincided with Abbott’s Press Conference being held that very day and all the media circus that went along with it – the humiliating public walk down the street, the un-necessary strip-search in the corridor and the solemn announcement made during the Press Conference. Also, when Howard was being elected for the first time, there was a bogus letter between him and Jeff Kennett that was released and damaged Labor’s chances of winning the election. Because the misuse of Commonwealth letterheads was a serious Federal offence, Howard agreed that the matter would be fully investigated by the AFP “after the election” but it was apparently and completely forgotten. Turnbull also had his own Godfrey Grech moment that didn’t work so well for him but the NBN one may have been arranged by others for his benefit. Howard, Abbott and now Turnbull – some people may see a pattern here. At least it’s elevated the NBN to the public discussion arena. I somehow suspect it won’t be because they’re a left wing idealogue determined to destroy the NBN just to make the Liberal Party look bad! So of course the Libs order the raid on the off chance they find something incriminating but hang the expense very typical of the LNP. Sounds to me like a bit of a “storm in a teacup”. This whole episode smacks of a Liberal attempt to, once again, denigrate the Labor party? If these “documents” were so “precious” or “secret” then one could understand, but, apparently they were of little or no consequence, which begs the question, WHY was it deemed so bloody important for the AFP etc to be involved? Oh, that’s right, the Liberals thought they would (once again?) prove just how “unworthy”, crooked etc the Labor party must be! And of course our “favorite” (NOT!!) newspaper organisation–the Mudrake press, naturally!–jumped at the chance to (once again!) splash across their front pages etc just how crooked ALL the Labor party must be. Sadly, just another typical Liberal/Mudrake beat-up! Great article, as usual, Rossleigh! “The ABC understands the representative, acting as a “special constable”, took photos of 34 or 35 documents that are subject to parliamentary privilege. Since when does a “special constable” send photos of the evidence to the complainant? I would very much like to hear Colvin’s explanation of why that employee was along for the ride and why he was allowed to do what they have conceded was illegal? You wonder why such a fuss has been made as there would be few that do not realise that the LNP have been shambolic in relation to the NBN. We are not hearing much about the National Security leaks; presumably a more important matter. Trust the LNP at your own peril. Oh Kaye Lee too late. The representative had already sent the photos onto NBN colleagues. NBN Co has acknowledged this. It now seems that the representative can be jailed, but if past Liberal instigated wrongdoers are anything to go by, AWB anyone, they will be heftily rewarded. Mr Turnbull was questioned by reporters about whether his office has ever leaked government documents. “I can only speak for my own time as PM, there’s been no suggestion that I’ve ever heard of any leaks from my office,” he said. What sort of a statement is that?????? Does it mean that he puts his fingers in his ears? Great comments on Rossleigh’s fabulous article from everyone. I wonder if Turnbull, who of course had nothing to do with the raid, has completely underestimated the intelligence of Mark Dreyfus QC. I will happily put money on Mark, who was very annoyed on Lateline last night, pursuing this a lot further than Turnbull will find comfortable, regardless of his position currently in the scheme of things. As Kerri observed opening comments, Utegate all over again. Haha, this is farce upon farce. The name of the NBN employee has so far been redacted in public documents. The Australian covered the name in the first paragraph he was mentioned and then left Mr Steere open in the one after. How very Keystone Cops it all is. I reckon someone will make a great comedy film out of all this one day. Even Rupert, the darkly malevolent force in the background appears to be wearing giant clown shoes. What a useless pack of idiots. Gotta hand it to the AFP. Prewriting the script for series 5 of Rake. A few of years ago I remember when writing my blog that things with this ruling rabble had progressed very quickly from Orwellian to Kafka-esque and thinking that I might be being a bit over-the-top! Could some-one please advise what dystopian level follows Kafka? The LNP really are the most incompetent body I have ever heard! Fancy drawing attention to their own NBN stuff up by using an NBN official as a “Special Constable” to send back pictures of what the AFP, find and thinking its not going to come out in the public arena! So does this mean that if Joe Blots puts in a complaint against his neighbor Farmer Smith, that Mr Blots gets to go on a police raid onto the property? Seems somewhat odd, that an accuser is sequestered into an operation. I don’t get it, an employee from NBNco has released secret documents showing the NBN is an overpriced dud. What’s the secret? We all know it’s an overpriced dud. Apart from that don’t we the taxpayers have the right to know how much it is costing us and how much of a dud it really is? What the hell has this to do with the federal police? And why were the media tipped off? Lights camera action….What a bloody circus. Who needs a thriller in manila. I reckon the match up Mark Dreyfus QC v georgie brandis qc(how and from where?) would be a match well worth watching. It would be a bit like a superheavyweight v a watermelon, but who cares who kicks georgie’s arse. Of course the AFP are not taking directions from the Libs. Just like the investigation into Christopher Pyne and Wyatt Roy for stealing/copying Slippers diary stopped happening once an election was in the wind. Why has that stopped? Why were two MPs not stood aside while investigations took place? Of course they will join the list of Federal members and staffers who walk from the courts scot free because the judge thought they have been ’embarrassed’ enough and don’t require punishment. 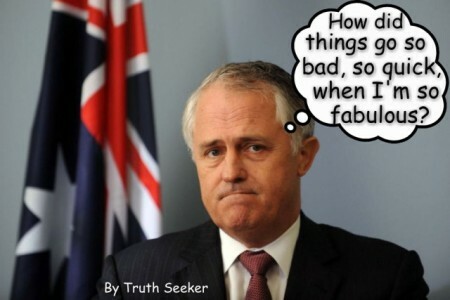 i think much can be made of turnbulls turn as comms minister and the frankenstein NBN in process. As the information re NBN is correct, you can only suppose we are involved in another witchhunt for the whistleblowers. It’s a relief to read so many other people are a wake up to it also, but it is dangerous for democracy for government departments, including police, to be politicised in the way this case demonstrates and yet another ugly blot on Turnbull’s unpleasant image. This country’s political and legal system needs to change. And soon. How can it be that all parties involved with the NBN knew what was going to happen when Turnbull was handed the reigns but like a train-wreck, it was allowed to happen anyway over a period of years? It is not only criminal in that a politician knowingly destroyed one of the nation’s most important infrastructure projects, he and the LNP have swindled billions of Australian taxpayers dollars to achieve it. It is treasonous behaviour. Our legal system seems to be too weak to hold politicians to account for destructive behavior in their own portfolios..
Turnbull and Dutton should be in goal for Fraud and human rights abuses respectively. Greg Hunt for environmental vandalism. It is obvious. This episode clearly demonstrates that Australia is not a democracy. Gee, Paul Walter, accusing the AFP of “politicising” this is rather over the top. I mean, surely they’ll investigate the leaking of the sealed evidence with the same gusto. And that should be an easy investigation. Evidence was leaked. It shouldn’t have been. Who was responsible? A member of the AFP who was appointed as a “special officer” for the express purpose of photographing the evidence and leaking it. Should be able to wrap that one up before midday and still have time to break for coffee and donuts! But wouldn’t that depend upon them having their eyes open, Rossleigh? introducing the ‘National Security’ theme was more than just an over reach fudge. It demonstrated a lack of judgement. Lets see the passing on of the photographed documents would be both contempt of the Federal Court AND contempt of the Senate and they know exactly who took the photographs! This would be Hilarious if it wasn’t so incompetent. Firstly there is the choice of leak to investigate. The leaking of embarassing information about the so called NBN and it’s so called cheaper, faster and sooner. I wrote in 2012 that you just could not have an NBN with Copper so Malcolm Turnbull had his wires crossed from the start. The Amateur Hour came when Abbott said that Malcolm (bless him the innovative little conservative) had virtually invented the NBN. It continued with the lies he told about Labor FTTP and it’s cost saying no cost benefit analysis had been done. What is a Business plan for goodness sake if it’s not such a document? Then the Liberals got into power and introduced their second hand Multi technology mix. Then the cost blew out. Then someone leaked a document saying that its slower (speed wise), slower (time wise) and a whole lot more expensive. But we all know that that is the case, so these documents must be dynamite politically. I cannot see this as being any other than a Political raid and that the AFP have been duped into doing it. now they have mud on their faces and it has backfired on the Turnbull Government. Then we find out that an NBN person is on the raid and they have been sworn in as a special Constable by the AFP. 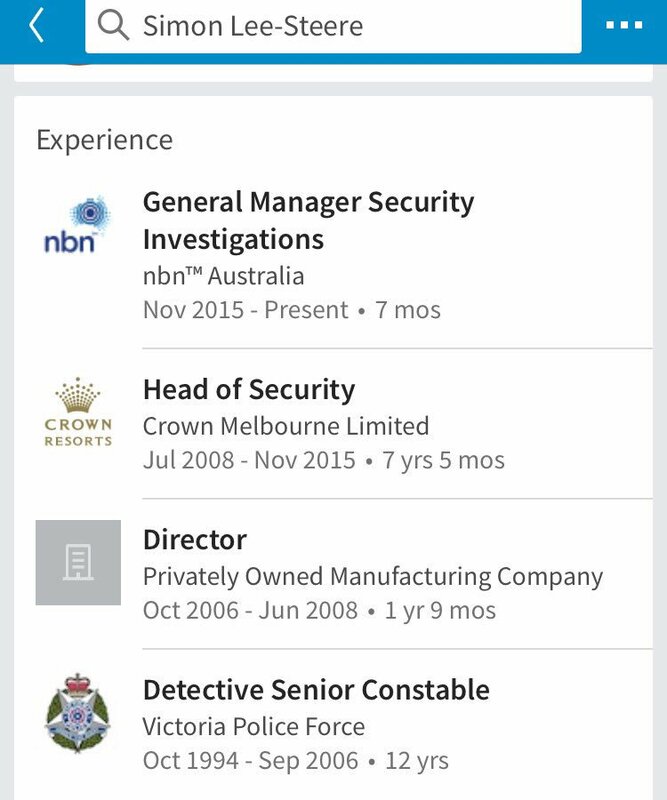 Apparently this person was a Vicpol officer for 12 years, head of an Australian Casino security for a while and is now in NBN co in a security position. AND he takes photos at the scene of an evidence gathering operation and then sends those Photos to the Complainant. I wonder what the Warrant to search the premises said. Whether his actions were against that warrant and whether the AFP allows it’s special constabulary to send evidence to the actual complainant before it has been evaluated by the AFP officers. At least this would be a breach of AFP protocol and would be an argument for defence lawyers in any proceedings which may be instigated. Do his actions in fact taint the evidence? All interesting questions. I have enjoyed every minute of this farce, because many years ago I spent 4.5 years as a police Constable in another life and on emigrating to Australia I spent much of my working life in 3 Major Telecommunications companies/Commissions and so understand the benefits of the NBN that Labor proposed and the complete farce that is the Multi technology Mix. I also have a University qualification in Business and can tell you that the rate of return in the Labor NBN business case was 7.1%. For the uninitiated that means every dollar invested in the network would have been returned to the NBN co PLUS 7.1% extra as Profit. So far from being a cost to the community the NBNCo would have made a positive return to their Shareholders, who are the federal Government, The Treasurer and the Minister for Communications. The other thing it would have done would have been to massively catapult Australia into the innovative and agile country that Malcolm Turnbull keeps paying lip service to. It’s only 35 years since I bought my first computer in 1981 and the internet is/was a creature of the 90’s. I wonder where we will be 35 years from now? I won’t know as I doubt I will be around, but don’t we owe a future to our Kids and grandkids? That future would be assured if we had a political system which didn’t seek to retard development and to keep their plans to retard development secret. Imagine if the FTTP was now being rolled out as enunciated by the NBNCo under Mike Quigley? What a future we would face. Much better than the one we face with the spiteful crap that this raid and it’s Political overtones presage. So how are the Murdoch media handling this? My guesses would either be that they are ignoring it, or spinning this so it looks like it’s somehow Labor’s fault. Hope I’m actually wrong here but past history would suggest either of the above. A. a whistleblower within the NBN leaking to the media information about the failures of the NBN rollout. Well Turnbull back as Opposition leader believed having moles in departments, giving out information was OK. OK for him to receive and use it, Does that answer the question? Well documented Vince O’ Grady, but as a regular viewer of Question Time for my sins, I do not recall too many penetrating questions asked by the opposition of Turnbull when he was Communications Minister as to why their alternative was neither technically current or the purported savings flaky. Will they use Brandis’ metadata laws to uncover who the photos were sent to? I doubt it, because Abbott looms guilty as hell in the background and that phone is already down the bottom of the harbour. We might also see some more raids where Muslims that have been under surveillance for more than a year get charged in appropriate times like elections. Kaye Lee May 20, 2016 at 7:56 pm: “Since when does a “special constable” send photos of the evidence to the complainant? I would very much like to hear Colvin’s explanation of why that employee was along for the ride and why he was allowed to do what they have conceded was illegal?” The nub. Let’s see who asks the question. I see that some here are questioning the special constable. The use of a special constable, called different things in different forces, is quite legitimate and necessary in some cases. NBN have made the complaint and supposedly know exactly what was “stolen”. Rather than describing it to the enforcement agency and increasing the likelihood of mistakes, a representative is sent along to identify the specific items. I use the word stolen reservedly and in this case it seems the complainant’s representative way overstepped the mark. The alternative to using special constables is to vacuum up everything in a raid and afterwards spend a very long time sifting out the irrelevant from the target material. Mobius, stolen wasn’t on warrant, It stated “alleged unauthorised disclosure of Commonwealth information”. Elsewhere it has been stated that these documents are stamped with something along the lines of being private documents, I would assume they would have NBN somewhere in the headings. Conroy has attempted to table these documents. Have been raised and rejected in senate hearings. I can’t see why a NBN official would have to tag along as special constable.. It appears he has been link to AFP as special constable for years. The Commissioner said his wouldn’t be collecting evidence. he was there to verify they were what NBN was seeking. We know by looking through the window, he was very busy taking photos of up to 32 documents, which he texted to some 20 people. (Excuse given for further verification). No this exercise stinks to high heavens. I would be surprise if Commissioner was aware of what was to occur, Well details anyway. What we don’t know, if Labor has originals or copies, By wording of the warrant, only copies are involved. I suspect the whistleblower would have been one old team that Turnbull sacked. Just a guess. Much of what I have written is guesswork. What I would like to know, if police ever ask Conroy any questions before this raid. Why it had to be carried out in the night hours, especially in the home of the staffer. If there was other family in that house. Magistrates censured police for similar behaviour for many of the raids during TURC. Pointed out where there were kids involved, was not on. Mot necessary. This is not national security, it is no more than Opposition having information, that should be available to them anyway. Nothing to do with commercial interest or contracts. They are something similar to audits on what Labor had done and work under this mob. Why the police didn’t seek advice of the legal situation when government is in caretaker mode. Was wasn’t issue of parliamentary privilege raised, Something one would expect a expert AFP to know. I suspect PM was unaware. If he knew,could only mean the man is plain stupid. I suspect PM began this last year, then let it slip his mind. Some in NBN thought it was good way to embarrassed Labor. Acted off their own bat. That is the only explanation that makes sense to me. By the way, I am not a lawyer, only making educated guesses. Could be wrong on many things. Are there any solicitors out there that have any idea, any judgement of what has occurred. There were also four media outlets and blog sites mentioned on the warrants. PM has used terms that it is definitely clear Conroy has stolen documents from NBN. No alleged. How does he know, unless he is talking about why Conroy tried to table in the house or senate hearings. I am not too sure where. Wording warrant suggest NBN still have the originals. PM is suppose to be a great barrister. One would think his language would be deliberate. I suspect Shorten has as clever mind as PM. Is capable playing PM’s games. Both are still in mortal combat to gain full control of the campaign agenda. I hope Labor wins. Abbott was in Melbourne last week? I can’t see what PM has to gain out of this farce. To take along NBN official is saying Conroy is guilty, That everything that comes from government and NBN is truth. Proven truth beyond reasonable doubt. Aortica there were plenty in senate estimates. That is where this farce began. Some bitter exchanges where NBN officers bluntly refuse to answer any questions. The senate hearings is the only place where they could be forced to answer questions. Even there, not many got answers. What we have seen Thursday follows on from that. Ahh… KL… we already have that… what’s next? Fact: AFP officers are the rejects from the state police forces, and are regarded as such by 99% of state police officers. Police friends of mine constantly refer to the AFP as glorified security officers with no hope of joining regular police forces. Wayne: What, please tell, is democratic about australia? The population is legally coerced into voting, though many don’t. Donations by big business and unions seem to give those entities more sway that the interests of individual voters. Members of parliament, mostly, vote as their party decrees not as their constituants may wish. Democracy is best defined as the tyranny of a small majority over a slightly smaller minority. It seems almost weekly that we hear of more corruption, of rorts by polititians and now apparrent use of the AFP for political ends. This country is possibly best described as a corrupt oligarchy, definitely not as a democrasy! A politicized police force is a danger to democracy – remember J Edgar Hoover.